While walking between sessions, the steel structure of the new Foisie Innovation Center were taking shape on the north side of the main quad. The construction activity provided an appropriate backdrop for a conference about the changing needs for facilities at schools. The new 78,000 square-foot building will blend instructional space — including labs, maker space, and high-tech classrooms — with a three-floor residence that will serve as living quarters for 140 students. This blended use design was one of the topics discussed by Laurie Leshin, president of WPI, and Judy Nitsch, an alumnae and Trustee of WPI and principal of Nitsch Engineering. Judy also described WPI’s efforts to create Gateway Park as a partnership between WPI and the city of Worcester. 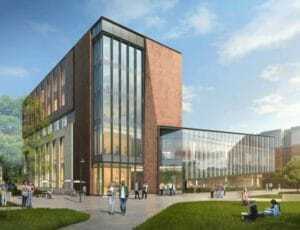 Dubbed “the next Kendall Square” the cluster of buildings on the north side of campus features 240,000 square-feet of offices and research facilities. Triumph participated as a sponsor of the breakfast and keynote presentation about the challenges facing campus planners. Triumph has an extensive client list of both public and private colleges. The conference included tours of Holy Cross, Assumption College and Clark University which are located nearby. One of the most popular tours was WPI’s robotics lab which has grown over recent years to occupy several buildings. 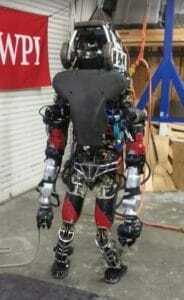 The star of the robotics program is a humanoid robot nicknamed “WARNER”. He/She/It was a finalist in the DARPA challenge in 2015. Developed in response to the meltdown that occurred at the reactor in Fukashima Japan after the earthquake and tsunami in 2011, DARPA set up a challenge for roboticists to complete a series of skills that would be straight-forward for a human, but impossible for robots available at the time of the disaster. The skills included climbing a ladder, turning knobs, and clearing debris. WARNER finished in the top third of the competition. The breakout sessions — designed for campus planners, architects, builders and educators — focused on the challenges posed by rapidly changing demands on facilities and the increasing need for collaboration between institutions, companies, students and instructors. To illustrate the opportunities of challenges of partnerships, one session featured a panel of representatives from the 11-member consortium called the Higher Education Consortium for Central Massachusetts or HECCMA. The consortium enables students to cross-register and get credit for a wide variety of courses from any of the member schools.